One of the most popular large houseplants, Ficus are easy and low maintenance if the basic needs are met. All Ficus produce a milky sap when cut or damaged that can cause skin irritation for sensitive individuals. It is also mildly toxic if ingested, causing stomach upset and vomiting—something to keep in mind if you have curious children or pets. The tropical Ficus all thrive in warm temperatures and high humidity and bright to moderate light. They are excellent dramatic accents to your home décor. Light: Bright to moderate. To keep growth even, rotate the plant weekly. Water: Prefer being slightly dry (but never allow to wilt). Allow the top 1-2” of soil to dry before watering thoroughly. Check the bottom drainage holes occasionally to be sure the soil at the bottom of the pot does not become constantly waterlogged even though the top dries (this will kill the lower roots). If waterlogging at the bottom becomes a problem the fig should be repotted to fresh soil. Fertilizer: Liquid feed during active growth in late spring and summer, or apply Osmocote for the season. Temperature: Between 55F and 85F. Repotting & Pruning: Figs do not mind being relatively pot-bound. Repotting is needed only when it becomes difficult to water, and should be done in spring. When repotting, check for and loosen coiled roots exactly the same way as you would (or should) for a landscape tree. Repot with a good-quality potting soil. Pests: Mealy bug and scale can be a problem, as can spider mite in dry conditions. Treat with any houseplant-safe pesticide. Due to the size of Ficus, repeat treatment is often necessary. Light: Bright light. If the light is too low, Ficus may drop the majority of the interior leaves, leaving just a few leaves at the tips of the branches. Water: Allow the top of soil to dry before watering thoroughly. Do not allow to sit in a saucer of water for extended periods. There may be a significant difference between the amount of water needed in summer vs. winter. Repotting & Pruning: Weeping fig will tolerate being quite pot-bound. Leaf drop is normal after repotting weeping fig. Size can be maintained by regular pruning, preferably performed in early spring to allow the summer for regrowth. Hard pruning (reducing by half) can be done and the Ficus will recover nicely. Weeping fig has a quirky habit of dropping leaves when its environment changes, so rest assured it WILL drop leaves once you bring it home (or inside from outside, or outside from inside, of after repotting…) and it is perfectly normal. Usually only about a third to a half of the leaves are dropped, and will regrow. If a larger percentage of leaves drop suddenly, look at the environment (water, temperature, light, humidity) and adjust anything that might be a problem. Ficus thrive when summered outdoors, and while they can tolerate full sun for part of the day, it is very important that you transition to sunny conditions gradually, or the leaves will sunburn (this looks like bleaching of the leaves) and drop. Transition by starting in full shade, then every 3 to 5 days, moving into brighter shade, then filtered sun, then a few hours of morning sun, etc. F. benjamina is particularly good at filtering formaldehyde, toluene, and xylene from the air. Very similar to F. benjamina in habit and care, with thicker, very elongated leaves. Much less likely to drop leaves. Extreme light or temperature changes will cause some leaf drop. Light: Bright light to some direct sun. Keep the large leaves free of dust by wiping gently with a damp cloth. Water: Fiddle-leaf fig is sensitive to overwatering. Be sure to allow the soil to dry between watering. Fertilizer: Does not require a lot of fertilizer. Feed in summer with dilute (1/2 strength) fertilizer monthly. 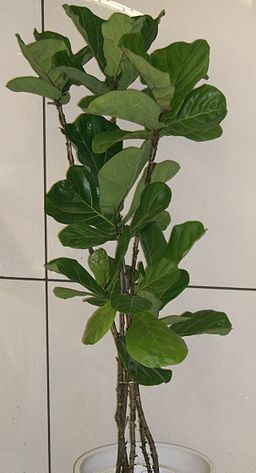 Fiddle-leaf fig are slow growing, with relatively few leaves on the plant. Therefore, avoiding damaging those leaves is important. Low humidity, low temperatures and under- or over-watering can cause edges of the leaves to brown. Light: Bright to moderate-low, avoiding direct sun. Rubber tree’s large, thick leaves look best and absorb the most light when wiped clean of dust regularly. Water: Rubber tree is sensitive to overwatering. Be sure to allow the soil to dry between watering. Repotting & Pruning: Rubber trees tolerate being pot-bound. Repotting is needed only when it becomes difficult to water. When repotting, check for and loosen coiled roots exactly the same way as you would (or should) for a landscape tree. Repot with a good-quality potting soil. Rubber trees can be pruned or branching can be encouraged by topping the stems. A few new branches will form wherever a cut is made. Cold temperatures can cause rubber tree to drop leaves. Avoid temperatures below 55F. The stems of rubber trees can remain relatively soft (one might say rubbery…) even as the plant grows larger, requiring staking to keep the stem upright.